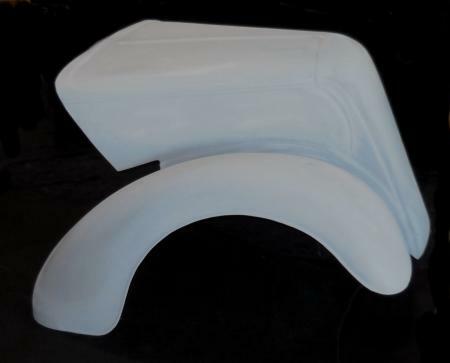 GTO LEMANS 1968,1969,1970, PONTIAC "Race Weight Hoods"
Here it is, the famous ram air hood, now available in high quality fiberglass. We think this is the best reproduction 400 ram-air hood ever made. It has full inner structure and molded in steel inserts. 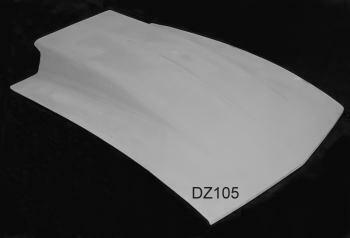 Scoop inserts (GT-401r&L) are fiberglass replicas and are bonded on to retain stock appearance. Now Goats and Pontiac Lemans can have new parts thanks to our exclusive mold design and attention to detail. This is not the ram-air hood, but a stock flat replica which bolts to original hinges. For 62-80 MG Midgets. Bolts to hinges and has full molded edges for perfect fit. Front edge has reverse edge exactly like original. Very sturdy with full inner bracing that is similar to factory style. Mount for secondary latch is provided. Cars with small engines need all the weight reduction they can get. Front chrome under-panel can be attached. Order MG191 for front latching style. Must use prop rod, springs not available. Hood for 76-78 Chevette. Grill opening is cut out for air flow. Features smooth gray gel coat finish and complete inner structure for rigidity. Small steel inserts are firmly molded in to bolt to original hinges. Front must use hood pins. Rolled edges on all sides insure a perfect fit. No grinding or sanding required to make fit. For 68-69 only. This racing style trunk lid offers quality materials and low weight. Molded edges and minimal reinforcement are standard features. Pins or dzus fasteners are needed for proper mounting of this lightweight trunk lid. Hinge mount style also available (see GT103H). 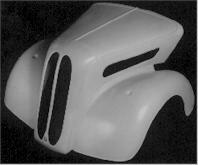 Early Z-cars can now be equipped with low weight fiberglass hoods. This hood will bolt to original hinges. Perfect for adding a cowl induction scoop or the scoop of your choice. This hood reduces overall weight of the car by 40 lbs. These fenders are exact reproductions of original factory fenders. Mounting flange is provided along inside of fender. Width is same as factory original. Low weight trunk lid for Anglia. Notches cut out for hinge mounting. Smooth edges to allow a perfect fit. Grill area has already been cut open to original size. 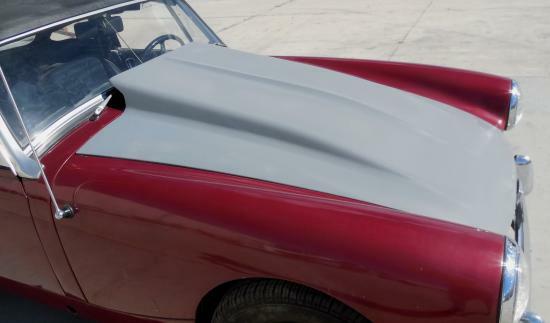 Side vents on hood are also cut to original dimensions. Fully hand laminated in 3 layers for maximum strength. Fender size and width are made to original factory dimensions. 54" wide. Grill area is blanked off. Side vents are blanked off. Fully hand laminated in 3 layers for maximum strength. Fender size and width are made to original factory dimensions. 54" wide.